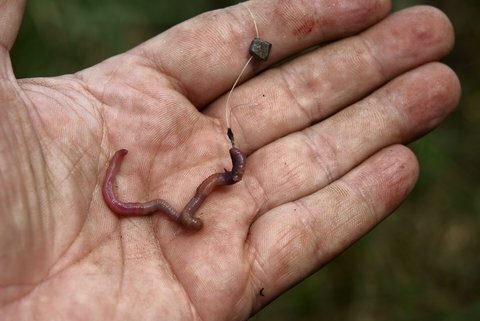 For many anglers, live worms are the first bait they ever fished as children, but as they grow older and their fishing skills mature, most abandoned live worms and never go back. This is unfortunate, because live worms are arguably one of the best all-around baits available. Whether you are fishing for sunfish, perch, walleye, bass, catfish or trout, live worms are effective and will take fish on a consistent basis. Not to mention, live worms are free. You can generally dig up as many as you need in your backyard. If you would like to give live worms a try this season, here are some important tips that will improve their effectiveness. The initial impulse is often to use night crawlers, because they are larger and meatier, but night crawlers and worms are equally effective. A general rule to follow is that you should use night crawlers for larger fish, such as walleyes, bass and catfish. Larger fish are attracted to the larger food offerings. Worms can be used for smaller fish such as sunfish, yellow perch and trout. This however, does not mean that worms will not catch larger species of fish. There are a variety of ways to hook a worm. Some people bunch the worm up on a hook, while others thread the hook through the worm. The best choice is to present the worm in the most natural way possible, so that it can continue to wiggle and attract fish. One of the best ways to do this is to run the hook through two or three points on the worm’s body. This helps to give the worm a natural appearance in the water. In recent years, new strategies for presenting worms have gained popularity. Among these methods are gang hooks, which are two hooks tied in tandem. This lets you hook the worm on both hooks, giving it a natural presentation. Another innovation is the “off the hook” bait holder, which allows you to secure the worm to the shank of the hook without having to pierce it with the hook. This keeps your worms alive longer and reduces the chances of a fish stripping the worm from your hook. The time-honored tradition for fishing live worms is to fish them beneath a bobber. This remains one of the best ways because it allows you to set the depth of the bait, and the bobber is a great indicator for detecting even the lightest bites. Depending on the circumstances, there are other effective ways to present worms to fish. Using a heavy weight to keep the worm near the bottom, such as a Lindy Rig, is a great strategy for fish that hug the bottom, like walleyes or catfish. Another effective method of fishing live worms is to add the worms to a jig or a spinner. In some cases, this can provide an added attractor that can make the difference between a fish ignoring your offering or hitting your bait.